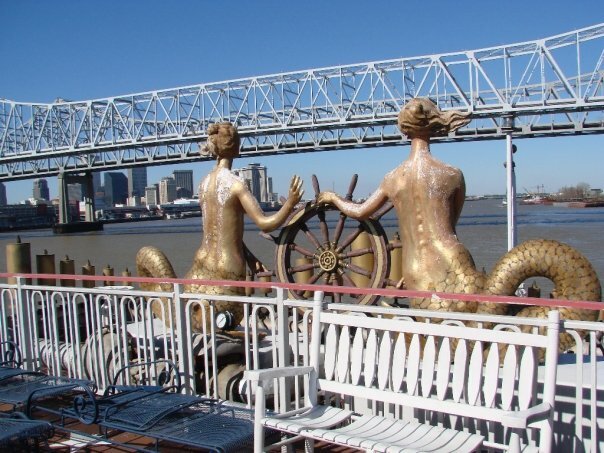 Everyone loved the mermaids on the bow of the Mississippi Queen, seen here in better days. Photo by Dave Thomson. Here they are just before the boat was dismantled in 2009; photo by Toots Maloy. 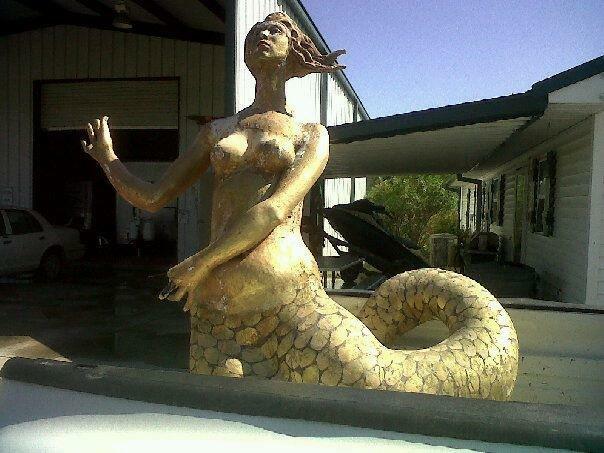 After the demise of the Mississippi Queen, the mermaids were lost for a time. 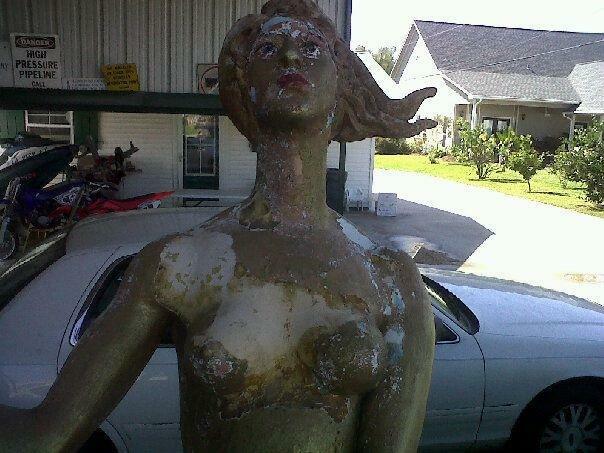 However, in 2011, they were salvaged by Norris Gros, friend of the riverboats from Louisiana. They then passed into the care of George Burch. 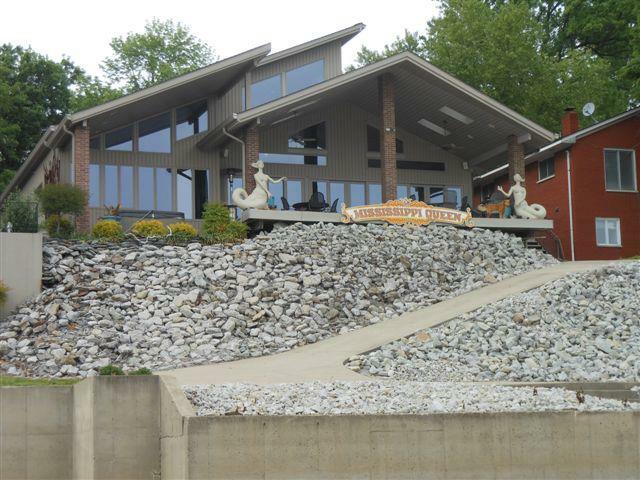 He is restoring them and will display them on a hilltop overlooking the Ohio River at MM 600.5. 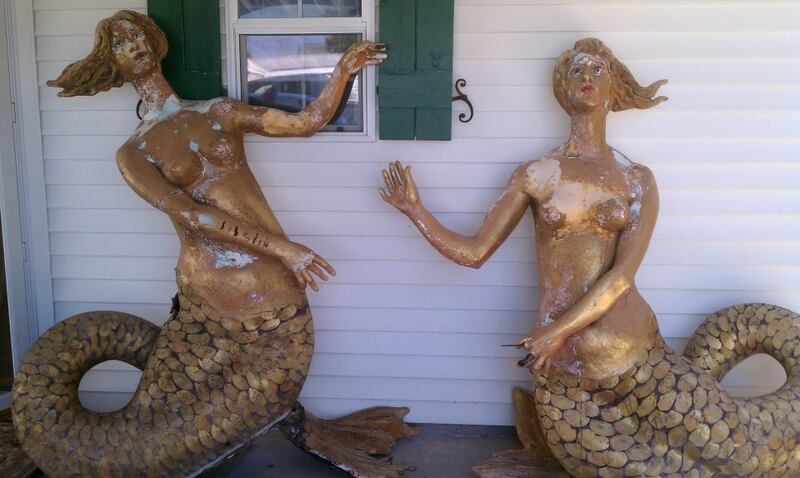 The mermaids as I found them in Pierre Part LA. They are being restored locally and should be ready for display this summer. Also, they will be displayed (temporary) for the Great Steamboat Race on April 25, Belle of Louisville Vs American Queen. If you happen to be on one of the boats try to get the Capt to give us a whistle or two in memory of the MQ. Another quick update on the mermaids. They are now mostly stripped of 8-10 different colors and coats of paint. The fiberglass bodies have a lot of cracks that are being repaired. We will also have to replace a fair amount of the steel that is inside that offers strength to them and is using as a means to mount them to something. They should be in primer next week and will hopefully be on display, although not painted in time for the Great Steamboat Race. Most of the body work has now been completed and this is what they look like as of last Friday April 20, in light gray primer. Sorry for the rope used to hold them in place while being worked on, but no good way to do so otherwise. Still lots of structural repairs to do and need to construct steel platforms for them to sit on and to be used to bolt them down. The short term plan though is for them to oversee the Steamboat Race from the IN shoreline in as-is condition, and then go back to the shop for final repairs and finish paint. April 30, 2012, George Burch: fourteen year old Lucy Bell sits watch with the mermaids, overlooking the river, and awaiting the steamboat race. 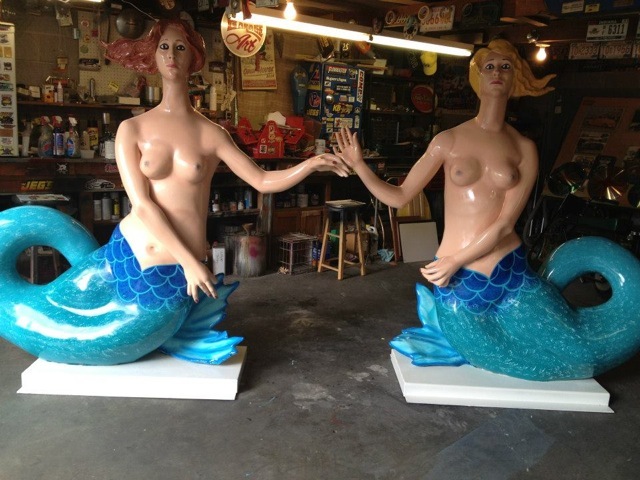 For those interested, we placed the mermaids on temporary display Saturday evening. They will remain there through the week (and boat race) and then return to the shop for final repairs and paint. They will eventually end up paired together as they once were for their first 35+ years with a ships wheel in between. May 24, 2012, George Burch: the girls have been out on the deck enjoying these great warm Spring days for these past 4 weeks. Last night a couple of neighbors helped me load them in the enclosed trailer for their short trip back to the body shop, for final repairs. Following that they will be headed to the artist's final touch(s) in paint. I intend to apply urethane clear as their final coat for long term protection. Then they will return home for semi-permanent placement overlooking the Ohio. They will be facing East/ southeast and will see the morning sun each day. A fitting way to enjoy early retirement if I say so myself. My wife Kim reminded me last week that the girls are now about 36-37 years old. 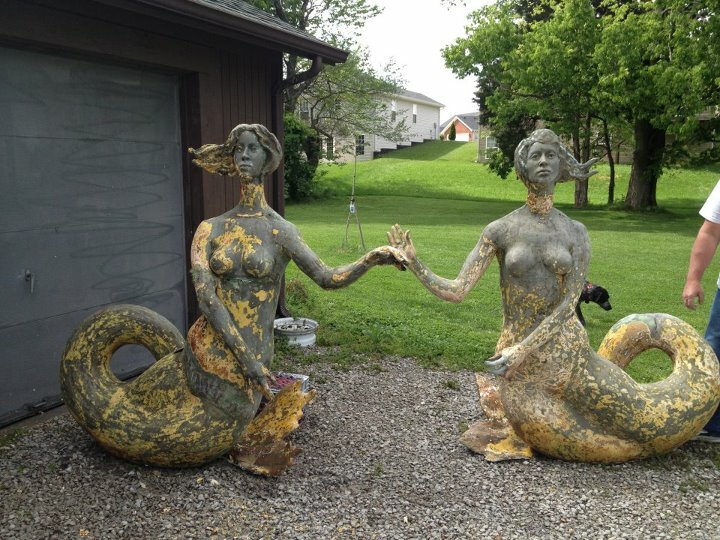 June 19, 2012, George Burch: originally the mermaids were owned by two different guys in Pierre Part. 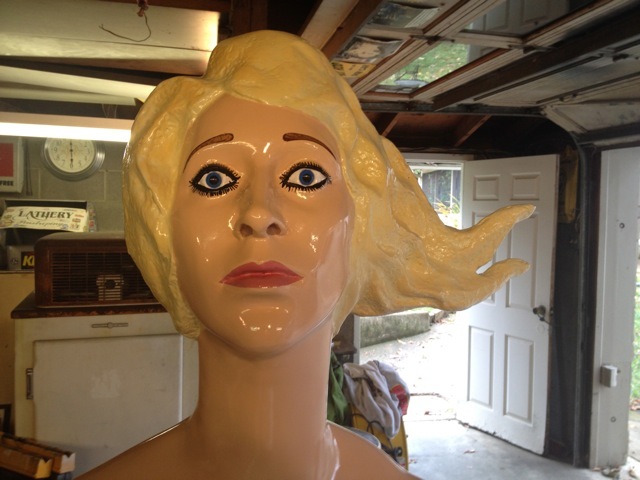 I got these pictures from Spanky, the gentleman that first had the mermaid for sale on e-bay. Actually it was his girlfriend at the time that ran the ad, Cathy from Chattanooga. Cathy helped put the whole deal together and if not for her and the timing of the whole thing it would never have happened. Cathy, Spanky, and I talked several times over a couple months and we eventually settled on a price that worked for everyone. 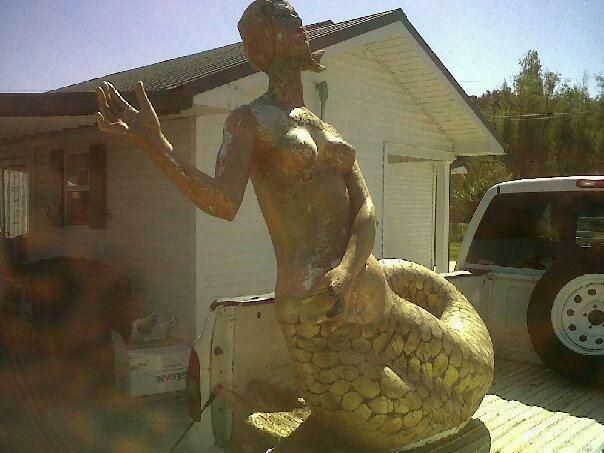 Interesting though that Spanky owned this mermaid and his good friend Keno owned the other as well as the pilothouse sign that I bought, so several folks were involved and had to agree. The tail was completely broken off the other one and both had severe cracks in the belly section and neck areas. My guess is most of that occurred while lifting them. BTW, the fingers have all been restored including their fingernails. Phillip Johnson: I have seen these displayed at your place George as we paddle by on the Belle in the evenings. George Burch: Yes, they were out for a few weeks but are now back in the body shop. 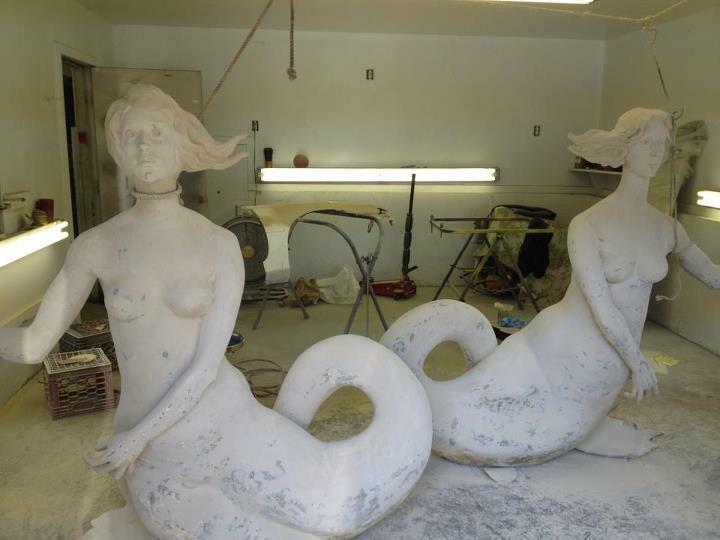 July 26, 2012, George Burch: Since it has been a little quiet here lately I thought I would post an update on the progress with the mermaid(s) restoration. I was able to visit the body shop yesterday and am now happy to report that their surgery is now complete. While they look pretty much the same as they did in early May there has been quite a bit more work done internally. There had to be steel inserted up in the body cavities and attached by welding the steel pieces together and then fiber-glassing them in. They are now structurally sound and able to stand on their own, currently bolted to a wood platform. I ordered aluminum base plates they they will be bolted to next, which should happen in the next two weeks. Then they are scheduled to be painted and clearcoated after which they will be attached to a concrete foundation. Just in time for summer 2013! 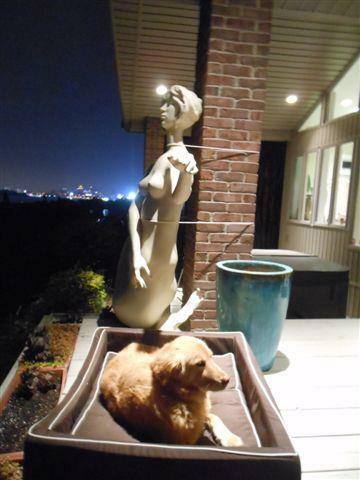 The mermaids and sign are now finished and are perched atop their new throne. Photos sent by George Burch. Cheers to the MQ mermaids! 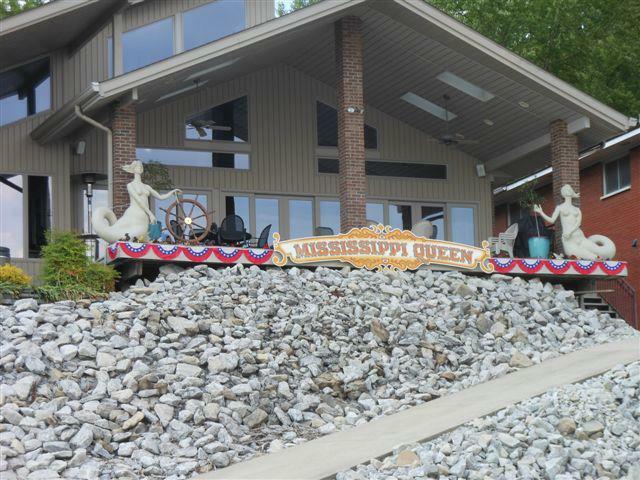 Be sure to look for them on the Ohio River at MM 600.5 - Jeffersonville, Indiana, near the Howard Steamboat Museum. 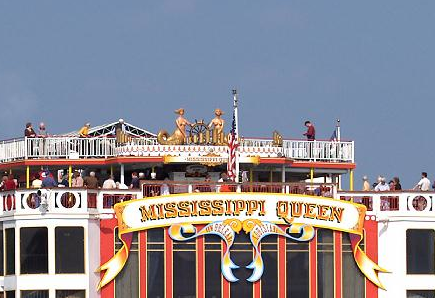 The Mississippi Queen christening and alleged CIA connections.